Any sort of Gen Y-er worth his place in this world knows this is the kicking start for the Captain Planet theme song. What many of these same people don't realize is that Ma-Ti, AKA “Heart,” was perhaps the most important member of the Captain Planet team. Instead of honoring him with the love (heart) and respect he deserves, they insult and mock him for his lack of powers and/or overabundance of elbowchiefs. I don't mean to get too punny, but I'll say it right now—Ma-Ti was the “heart” and soul that held Captain Planet and his team together. Without Ma-Ti, nobody could have talked to animals telepathically like he did. Nobody could have been the fifth wheel who seemingly did nothing but was vital to bringing forth the Captain. Which Planeteer could talk to a monkey? Not Wheeler, that's for certain. The episode that really shows Ma-Ti's worth is “The Conquerer.” In this episode, Zarm, the evil former ruler of Earth convinces the Planeteers to trade in their punily weak power rings for much more powerful power gloves. Everyone takes him up on this deal, EXCEPT for Ma-Ti. This is probably because much more powerful heart really wouldn't have any effect, but Ma-Ti stayed true to Captain Planet and Gaia. When Zarm tries causing a nuclear war, Ma-Ti can prevent it and save the day. It's a background like this that made me love Ma-Ti and his contributions to the team. So it should come as no surprise that when I decided I wanted to be a Planeteer for Halloween one year, I immediately started constructing a Ma-Ti related outfit. No other Planeteer was even a possibility—it's not like I was going to dye my hair red or anything. 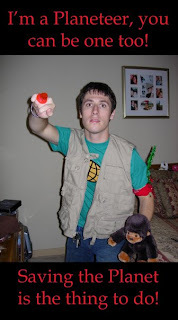 Getting the elbowkerchief and a stuffed monkey were just the start of my outfit. I needed to also get into Ma-Ti's state of mind. I used his heart powers to converse with the animals. Since my cat was the nearest animal, I found out he wanted food. With being in the mind of Heart, I got an even deeper appreciation for every thing he did. A person to rally around and mock—that's Ma-ti. Who gets the final word in bringing Captain Planet—Ma-ti. Who not only had a pet monkey, but went as far as naming it Suchi—Ma-ti. Who's awesome—Ma-ti. Who's Ma-ti—Me. Who therefore is immune to syphilis as depicted in the season four episode “Future Shock,” that's right, Ma-Ti-Me. I arrived at a deeper understanding. Ma-Ti brings so much to the table, while being so unsuspecting, and that right there is what a true hero does. I'm certain even Captain Planet would be jealous of Ma-Ti for those abilities, but the power of the Heart would calm him down. The Captain Planet theme song should have really included the line "Ma-Ti, he's my hero / gonna love the entire world / HEART!" Until it does, I'll just know it's true in my... well, in my heart.